50+ simple mehndi design ideas to save for weddings and other occasions! Mehndi is an integral part of all festive occasions in the Indian subcontinent. Right from weddings to festivals like Eid, Karwa Chauth and Teej, women adorn their hands and feet with beautiful henna designs. If you have an upcoming wedding or joyous occasion for which you are looking for a simple mehndi design, then you have stopped by just at the right place! To give you some major henna design inspiration, I have curated a bunch of simple mehndi design images, which you can save for reference. This list has simple mehndi design for beginners too! So, if you don’t have a professional mehndi artist to apply henna, all you will need is a mehndi cone and an easy mehndi design photo! This easy mehndi design on backhand has simple motifs like teardrops, circles and leaves that form an elegant pattern that’s minimalistic too. This simple mehndi design with easy floral and net motifs is a stunning option to wear for anything from Roka to Eid! If you don’t wish to cover your entire hand with henna and want to simply design the fingers, then this simple mehndi design image is a must-save for reference! This beautiful henna design has basic motifs like flowers, dots and leaves, which can be made easily and look lovely too! Why should Aztec pattern only be limited to outfits and accessories? Take this trend a notch higher by drawing it as a simple mehndi design on your backhand! Tip: Use black mehndi while making such designs, as it gives your mehndi a tattoo style look! This very very simple mehndi design just has lines and simple floral patterns! Perfect to get for your bestie’s wedding if you are planning to wear a similar haathphool! If you want a simple mehndi design but want to try something apart from the floral pattern, then this design with easy swirls, curves and spirals is a great option to try! Who said haathphool can only be a jewellery? Give this simple mehndi design a shot and get full brownie points for creativity and uniqueness! If you are looking for your very very simple mehndi design, then your search ends right here! These dainty henna pattern with roses, leaves and beads is too beautiful to not get made on your hands! Nothing quite beats the simplicity of a leafy vine, does it? You can get easy mehndi designs like these for any festive occasion or even at a wedding if you are a minimalist. 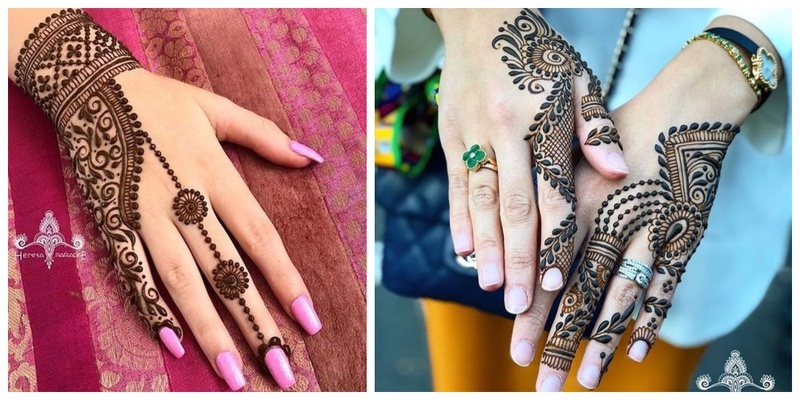 If you are not too keen on having a full hand of henna, then just some simple mehndi design on the wrist or cuff along with some beautiful motifs on the fingers is a great idea! Get modern and stylish with a simple mehndi design like this one that resembles a lace glove! Perfect for the bride tribe. If you like clean shapes and easy motifs, then this simple mehndi design with lines and geometric shapes is a must-try! Beaded mehndi motifs are growing in popularity since they give the henna is dainty and minimalistic look! Hop on the trend wagon and get a simple mehndi design with bead strings that are a sight to awe at! A simple band of henna design with flowers, leaves, teardrops and spirals is a pattern as old as time. If you prefer sticking to the classics, then these simple mehndi design images need to be in your gallery right now! If you are planning to wear a denim jacket with a Banarasi lehenga for your bestie’s mehndi, it’s best to get a bold mehndi design like this that exudes total bohemian vibes! Let that pretty henna design match your outfit and personal style! Tip: Get this style of simple mehndi design made in a black colour to give it tattoo kind of feels! Flowers can never be left behind when it comes to simple mehndi designs! Probably the easiest to draw, these flower-packed mehndi designs are perfect if you’re a floral lover like me! This simple and minimalistic backhand mehndi design is a great option for bridesmaids! The single finger design is perfect for all girls who believe that ‘less is more’. How many of these simple mehndi design images did you save for inspiration?